Located about 45 minutes from downtown Phoenix, Surprise is where you can connect all aspects of your life- family, work and recreation. Our charming community is surrounded by mountain park lands, a regional lake and pristine, open Sonoran desert. 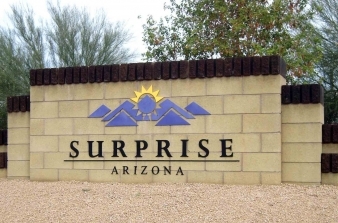 Our neighborhoods are clean, distinctive and unique, no wonder why nine out of 10 residents surveyed recommend Surprise as a place to live and start a business! Our city of over 120,000 people was just one square mile of farmland back in 1938 when Flora Mae Statler founded it. So why did she call us Surprise? According to Statler's daughter Elizabeth Wusich Stoft, her mother once commented "she would be surprised if the town ever amounted to much." With our success, she would indeed be surprised and proud! You can learn more about how this once small farming community transformed into Arizona's 10th largest-city in “The City of Surprise: A History in Progress,” a 104-page book crammed with photos and anecdotes, plus an accompanying DVD documentary set. The book is available for purchase at the Surprise History Project page, or you can watch the video at www.surpriseaz.gov/surprise11. Our Surprise Recreation Campus is home to professional sports and adult and youth recreation programming! In the fall our Surprise Tennis and Racquet Complex hosts a stop on the Champions Tour, attracting tennis legends John McEnroe, Andre Agassi, Anna Kournikova and Jim Courier! This 25-court venue is also open for tennis players of all skill sets to enjoy or take lessons. Residents love the pools, waterfalls and slides at the Aquatic Center. DreamCatcher Park is the city's first all-access sports facility. Hit the links on one of Surprise's eight golf courses. Hike and bike in the spectacular mountain vistas and clear desert air of the White Tank Mountain Regional Park. Get closer look at some of our recreational amenities in this “Explore Surprise” video. You will find medical services at nearby Banner Hospitals and several urgent care centers. K-12 schools are run by the rapidly growing Dysart Unified School District. Rio Salado Community College offers services in the city through the Communiversity @ Surprise and Lifelong Learning Center, and Arizona State University West is just 20 minutes from Surprise. Check out Surprise!